In this article we will see how to render Model Dialog box. In the view, we have referenced Layou which have script files reffered needed to render Dialog box. We have set modal property to true to render the modal dialog box. We have also set the height attribute. 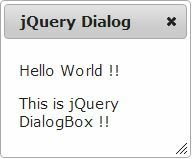 We have included the jQuery references needed to render Dialog Box. In the above demo, unless you close the modal you won't be able to access or click other elements of screen. Thus following the above steps we can achieve rendering Modal dialog box.